Throughout the film there are many instances that demonstrate the various “base images of the ‘grammar of race’” (164) that Hall discusses. The most obvious example is the characters Mantan and Sleep’n Eat, who fulfill the role of the ‘clown’ or ‘entertainer’. 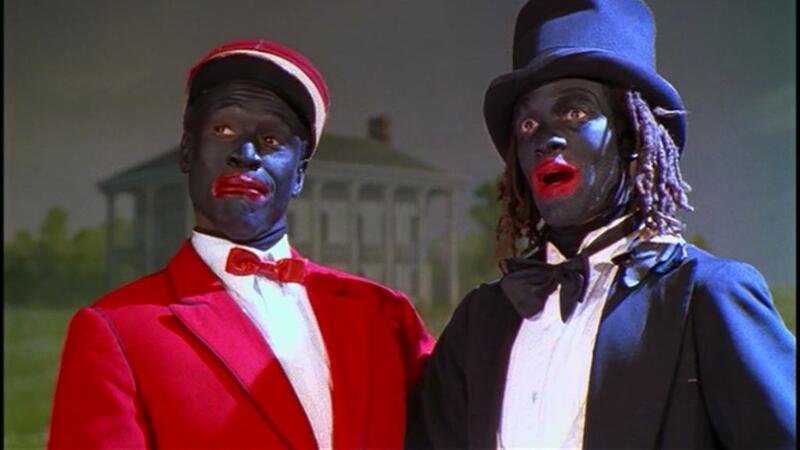 The blackface that both of the men are required to wear is, in itself, representative of their role as the ‘clown’ because the full black face paint and over-applied red lipstick mirrors that of the white clown. However, the deep root of the racist ideology lies in the performance itself; as Hall says, the ideology is captured in the “‘innate’ humor, as well as the physical grace, of the licensed entertainer—putting on a show for The Others. It is never quite clear whether we are laughing with or at this figure; admiring the physical and rhythmic grace, the open expressivity and emotionality of the ‘entertainer’, or put off by the ‘clown’s’ stupidity” (164). It is clear throughout the film that the primary audience of the Mantan show is not black. Even though there appear to be some black viewers, there is a distinct sense that the intention of the show is to entertain people like Delacroix’s white boss, who revel in the consumption of the black entertainer. In addition, Manray’s original dream was to be able to perform as a tap-dancer; while he is able to tap-dance on the show, his physical grace and skill is made into a comedy that primarily pokes fun at the silliness and stupidity of the over-the-top interactions between Mantan and Sleep’n Eat. Bringing the concept of the minstrel show into a contemporary context overtly exposes the racist ideologies of the show in a way that can only be seen from the outside (our world). Another significant example that Hall would likely pick out in Spike Lee’s portrayal of the show in Bamboozled is the highly comedic elements that it takes on. According to Hall, comedy, as a genre, is particularly prone to perpetuating these racist ideologies because it allows, “[us to] encounter race without having to confront the racism of the perspectives in use…comedy is a licensed zone, disconnected from the serious. It’s all ‘good, clean fun’” (165). In the film, the comedic elements of the Mantan show essentially serve as a mask that allows the audience to ignore the blatantly racist ideologies that the show perpetuates. It is clear that neither the audience or even the writer of the show can acknowledge the reality of this, that is, until they are forced to confront it through the live broadcast of Manray’s execution. Only at that point, when the form of media is taken completely out of its comedic context, can the audience face the racism that was there all along, both in the show and within themselves. In this sense, I think Hall would truly commend Spike Lee for his ability to call attention to all of the ways that we perpetuate racist ideologies; the film forces people to face this reality just as the audience faces the reality of Mantan and Sleep’n Eat. And now, here is my (somewhat) contemporary example of racist ideology in media. Ladies and gentlemen, I present: Steve Urkel. This video of “The Best of Steve Urkel” serves as a prime example of the ways in which media subtly presents blacks as the entertainer; Steve Urkel is entertaining, but it seems more often than not that we laught at him, rather than with him. The first clip is especially potent in terms of racist ideology because it reinforces the idea that white men (Jessie, in this case) still need to show black men/boys (Urkel) how to function properly in society.